What an incredible improvement on the overall deficit. A silver lining to a global recession. Again, we are closing the trade cap. 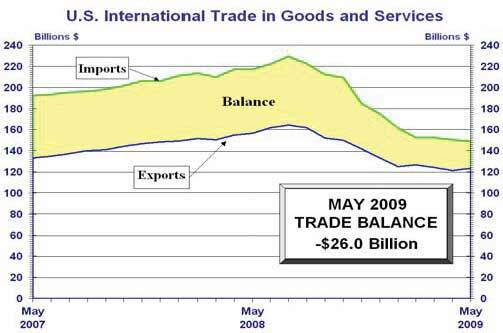 The U.S. Census Bureau and the U.S. Bureau of Economic Analysis, through the Department of Commerce, announced today that total May exports of $123.3 billion and imports of $149.3 billion resulted in a goods and services deficit of $26.0 billion, down from $28.8 billion in April, revised. May exports were $1.9 billon more than April exports of $121.4 billion. 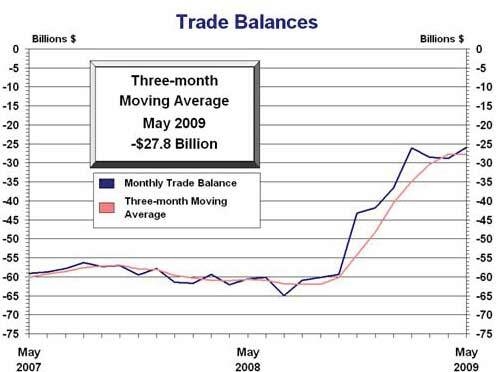 May imports were $0.9 billion less than April imports of $150.2 billion. In May, the goods deficit decreased $2.6 billion from April to $37.3 billion, and the services surplus increased $0.2 billion to $11.4 billion. Exports of goods increased $2.0 billion to $82.1 billion, and imports of goods decreased $0.5 billion to $119.4 billion. Exports of services decreased $0.1 billion to $41.3 billion, and imports of services decreased $0.4 billion to $29.9 billion. In May, the goods and services deficit decreased $34.6 billion from May 2008. Exports were down $33.3 billion, or 21.3 percent, and imports were down $67.9 billion, or 31.3 percent. This is the smallest trade gap or deficit since 1999. "The trade deficit report is another indicator that things are not improving as expected," said William Larkin, portfolio manager with Cabot Money Management in Boston. "There is growing pessimism about how quickly the U.S. will recover, which I think will be slower than people expect." Somehow I don't think a ballooning deficit is indicative of job growth. Volume? Sure. Increasing the actual trade deficit? Uh, ask all of those in the Manufacturing rust belt on that one.